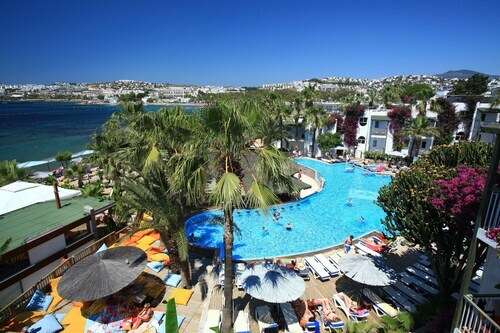 Expedia's Bodrum City Center vacation packages help you save cash! Bundling your bookings will give you more cash to splash for your epic adventure. Smart travelers who book a package deal on Expedia can save up to C$590*. With more than 400 partner airlines and 321,000 properties worldwide for you to pick from on our global database, you'll be jetting off on your vacation in no time! You can postpone your vacation plans with us because we do not charge cancellation fees for almost all of our bookings. It can be enjoyable to just amble around the streets in a new place, but sometimes it's sensible to have an agenda. Grab your schedule — we have plenty of fantastic ideas for your upcoming Bodrum City Center vacation. If you plan to stay in Bodrum City Center, there's no way you'll be able to skip Bodrum Castle. This famous attraction draws in scores of visitors from all corners of the globe. Ready to see it for yourself? This suburb just can't disappoint when it comes to excellent attractions. The Museum of Underwater Archaeology and Bodrum Windmills are some wonders that are just a walk away. The link to ancient history is strong at Bodrum Amphitheatre. Book in today and discover the results of significant archaeological digs. Travelers have a wonderful selection of things to do in this destination. Get a glimpse of what life was life many years ago at Mausoleum at Halicarnassus. Much more than just a collection of old stones, these artefacts of the past offer a fascinating insight into a bygone era. Still got some time to spare? A fixture of the skyline, French Tower is difficult to miss. Stand under it, cast your eyes upwards and gaze at this grand old structure. Taking a break isn't just about marking off destinations on a map. It's about the people we come across and the experiences we have on the way! Get the ball rolling with a Discovering Scuba Diving in Bodrum. This excellent activity is definitely worth telling the folks back home about. Head to our Bodrum City Center things to do page for a comprehensive list. In Bodrum City Center, you'll discover no less than 64 Expedia places to stay in. Book right now for the best luxury getaways and cheap vacations. There's no need to blow your entire budget on a place to rest your head. You'll discover decent beds with a low-cost price tag at the Moonshine Hotel & Suites (Marsmabedi Cad. 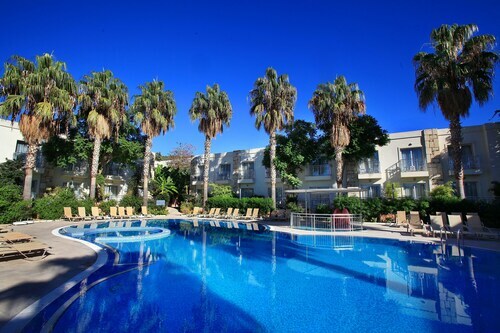 No: 47) and the Hotel Princess Diltua (Eski Cesme Mahallesi Eskidere Sok No:18). Eager to treat yourself instead? You can live it up at the Voyage Bodrum - Adults Only (Bardakçi Koyu) or the Salmakis Resort & Spa (Bardakci Koyu). Is convenient access to Bodrum Castle your top priority? The Marina Vista Bodrum and the Seçkin Konaklar are both just a hop, skip and a jump away. Let's be honest, no one loves waiting around at the airport. However, when you think about the unforgettable trip to Bodrum City Center that you're about to have, it becomes bearable. After all, you'll be only 20 miles (32 km) to the northeast of the neighborhood center when you step off the plane at Milas Airport (BJV). 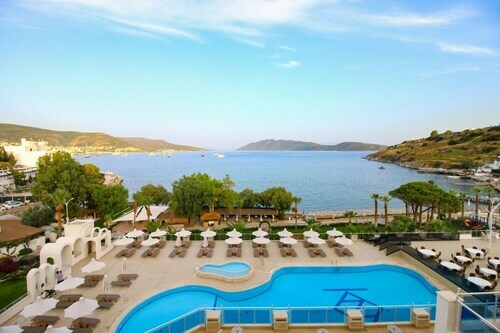 Located in Bodrum City Center, this luxury hotel is within 1 mi (2 km) of Bodrum Farmers' Market and Bodrum Beach. Bodrum Maritime Museum and Bodrum Bar Street are also within 1 mi (2 km). This family-friendly Bodrum hotel is located near the beach, within a 5-minute walk of Bodrum Bar Street and Bodrum Beach. Bodrum Farmers' Market and Zeki Muren Arts Museum are also within 15 minutes. 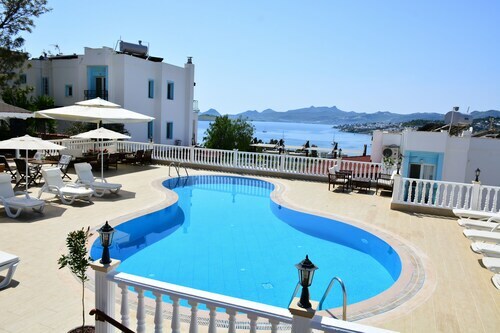 Located in Bodrum City Center, this beachfront property is in the city center and within 3 mi (5 km) of Bodrum Windmills, Bodrum Beach, and Bitez Beach. Bardakci Beach and Bardakci Bay are also within 1 mi (2 km). Located in Bodrum City Center, this hotel is within a 15-minute walk of Bodrum Marina and Bodrum Beach. Mausoleum at Halicarnassus and Bodrum Ferry Terminal are also within 10 minutes. Located in Bodrum City Center, this hotel is within a 15-minute walk of Bodrum Farmers' Market and Bodrum Beach. Bodrum Bar Street and Bodrum Maritime Museum are also within 15 minutes. Located in Bodrum City Center, this hotel is within 3 mi (5 km) of Bitez Beach, Bardakci Bay, and Oasis Mall. Myndos Gate and Bodrum Windmills are also within 3 mi (5 km). 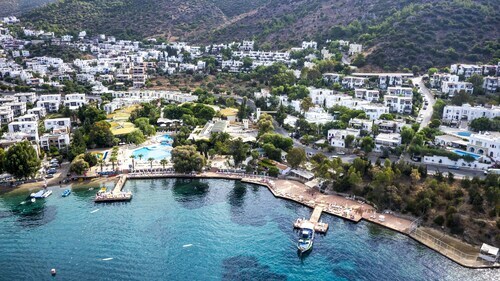 Located in Bodrum City Center, this beachfront hotel is in the city center and within 3 mi (5 km) of Bardakci Bay, Bodrum Beach, and Bitez Beach. Bardakci Beach and Bodrum Marina are also within 15 minutes. Located in Bodrum City Center, this beachfront property is in the city center and within a 15-minute walk of Bodrum Bar Street and Bodrum Beach. Bodrum Ferry Terminal and Zeki Muren Arts Museum are also within 2 mi (3 km).